BSA was formed in 1861 and the company was finally sold in 1957 to Tube Investments. They were there at the beginning of bicycle production, and played a major part in their manufacture when Great Britain was the world’s leading producer of bicycles, motorcycles and cars. BSA bicycles are still made in India. BSA started out as gunmakers and, through government contracts, helped defend the British Empire through the Boer War and two world wars. It’s interesting that the company name still exists …as BSA Guns Ltd. In the early years, BSA didn’t sell complete cycles, only components. 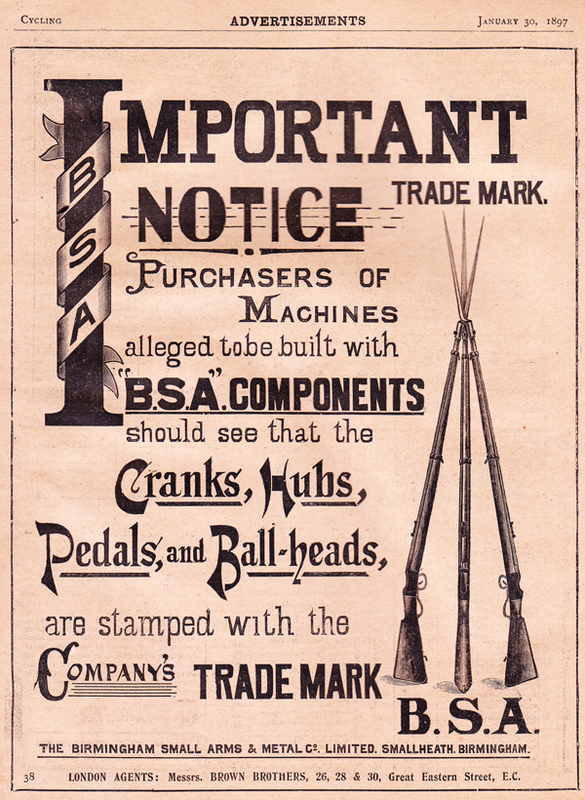 But, by 1908, despite excellent advertising campaigns, BSA had a public relations problem. Some cycle agents had been installing cheap parts but selling their bicycles as genuine BSAs. The company had taken quite a few to court to try and prevent the practice. However, genuine BSAs also had a good secondhand value. Unscrupulous dealers made a good living selling as-new ‘knock-off’ machines in classified ads from rented accommodation and moving house promptly afterward, making them difficult to prosecute. 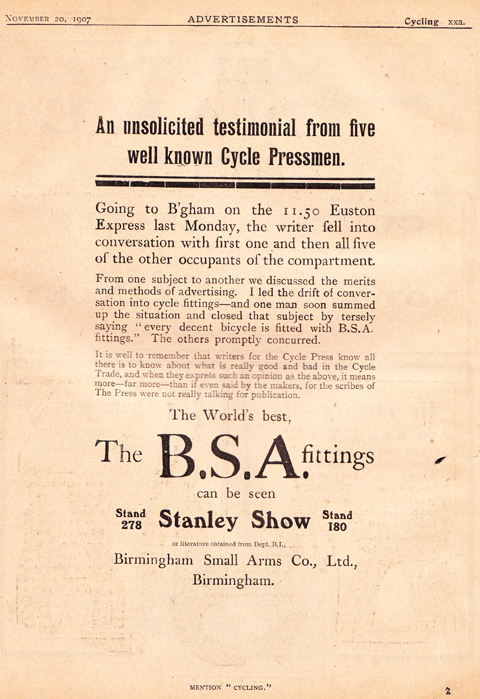 So BSA decided to supply complete machines and exhibited a full range at the November 1909 Cycle Show. In 1910, new BSA bicycles were at last available again to the public. This was opened in 1862, and though considered at the time quite an imposing edifice, the original B.S.A. factory is now a very small portion of the B.S.A. Works. Extensions have had to be constantly made until the present day works, at Small Heath alone, contain a shop floor space of over 26 acres. Further developments took place in 1873 when the manufacture of ammunition was added to that of rifles. For this purpose certain metal works at Adderley Park were acquired, and the Company became known as The Birmingham Small Arms and Metal Company. The first bicycle manufactured in any quantity by the Birmingham Small Arms Company was the ” Otto ” Safety Bicycle, an interesting illustration of which is given. It is curious to note that this early type of bicycle had its wheels side-by-side, instead of one wheel behind the other as later became the standard, and it was no easy matter to effect the satisfactory balance which was necessary before comfortable riding could be enjoyed. It is recorded that when the designer was negotiating with the Birmingham Small Arms and Metal Company for the manufacture of the ” Otto,” being anxious to prove that his machine was correct in design and principle, he offered to give a demonstration by riding down a winding staircase of about thirty steps. This performance was successfully accomplished, and evidently satisfied the management, as the manufacture of the machine was then taken over, and continued during the years 1880 to 1883. It was at this period the Company made the “Alpha” Ordinary Bicycle ; also the ” Beta ” and ” Delta ” Tricycles. In the meantime, in 1881, the manufacture of the “Omnicycle” Tricycle, designed by Mr. T. Butler, was taken up by the Company. This machine was a rear-driven three-tracker, propelled by a reciprocal motion. Another rear-driven three-tracker, the ” Devon” Tricycle, was manufactured in the following year for Messrs. Maynard, Harrison & Company. This machine possessed the advantage of a swing frame, which enabled the rider to use the whole of his strength whilst in an upright position, and was equipped with a “ground brake”. In 1882, the Company made yet another three-tracker tricycle with rear drive, known as “The Rucker,” for Messrs. Rucker & Company, of London. The output of B.S.A. safety bicycles and tricycles steadily increased during the next three years, but in 1887 the Government demand for rifles and ammunition rendered it incumbent upon the Company to temporarily discontinue the manufacture of bicycles and tricycles, and for six years nothing was done in this direction beyond the production of a limited quantity of Kelsey’s Duplex Safety Bicycle Crank Axle Bearings. During those six years the Company manufactured not only rifles, but also large numbers of six-pounder and three-pounder cartridges for quick-firing guns. When the Government demand for rifles and ammunition somewhat declined, the Company once more was enabled to take up the manufacture of bicycles, and early in 1893 commenced the manufacture of safety bicycle hubs, examples of which were exhibited at the Crystal Palace Show that same year. A little later the Company intro¬duced brackets, cranks, steering heads, seat lugs, chain wheels, fork and stay ends, and pedals, and at the Crystal Palace Show of 1894 exhibited a complete set of B.S.A. Cycle Fittings. From 1895 improvement followed im¬provement in the design of B.S.A. bicycle fittings ; a narrower chain line was introduced by the B.S.A. Company, and at the same time the length of B.S.A. crank was increased from 6in. to 61⁄2in., both of which developments enabled the rider to apply greater power and attain higher speeds. Further improvements in 1896-7 included the making of B.S.A. Block Chains, 1/4in. in width, for the manufacture of which a special plant, embodying the latest developments in cycle chain making machinery, had been added to the works. This season also saw the listing for the first time of B.S.A. Frames for ladies’ and gents’ machines. B.S.A. Handlebars were also manufactured at this time, and the famous B.S.A. Spanners, designed to fit all sizes of B.S.A. nuts, which had been carefully standardized, were first produced. The following year standardization was more fully recognised as being expedient and desirable, and the catalogue for 1898 makes mention of the fact that the standard patterns of the previous year would remain practically the same, as no alterations were deemed necessary. A plant for the production of brake-work was installed during 1898, and the B.S.A. Plunger Front Brake was first listed in that year ; the brake-shoe being fitted with patent rubber brushes or solid rubber blocks as desired. A malleable iron foundry was added at this time, and also a plant for making steel balls. In 1899, although as previously stated the general design of bicycle frame had become practically standard, and the method of drive by chain to the back wheel was the invariable practice, numerous improvements in detail were made with a view to securing ease of propulsion and the transmission of the maximum amount of power from the rider to the back wheel. To this end a new chain wheel was produced by the B.S.A. Company, with more than twenty teeth-which number had hitherto been the maximum ; wheels for 1⁄2 in. pitch roller chains were made 3/16 in. wide roller chains of the same size were produced, and at the same time the chain wheel was made detachable from the crank. To ensure greater strength and longer service, the side plates of rat-trap pedals were also fitted with stays. The famous B.S.A. Cam Chain Adjustment was also introduced in the same year. The following year, 1900, saw the introduction of the B.S.A. Free Wheel Clutch and the B.S.A. Back-pedalling Rim Brake, both of which achieved instant popularity. It is interesting to recall that the B.S.A. design for 1900 provided a somewhat longer wheel base on account of the demand for long cranks. A Front Pull-up Rim Brake was designed in 1901, and B.S.A. Mudguards and stays were first made in the same year. Fittings supplied by the B.S.A. Company in 1902 included sets for path racer, light roadster, full roadster, and ladies’ machines. This year also saw the introduction of the standard pattern Spring Frame which was supplied to the trade complete. The B.S.A. Spring Frame was one of the most successful ever put on the market, and numbers are still in use after years of service. The Boer War gave an impetus to the sport and practice of rifle shooting, and upon its conclusion in 1902 there began a notable increase in the number of rifle clubs in Great Britain. To cater for the new public demand the B.S.A. Company promptly designed a special Service Pattern Rifle, which was used with Morris Tubes ; this was followed by the Service Rifle fitted with a barrel made specially for the ’22 Rim Fire Cartridge, and as a result of the readiness of the B.S.A. Company to handle the new demand, the private trade in B.S.A. Rifles was put on a new and much wider basis. Further developments included the manufacture of a rifle designed by the War Department specially for short range practice, which was known as the War Office Miniature Rifle. This type has been largely used all over the world in musketry training. Amongst road racing cyclists two representative B.S.A. riders were T. Peck and C. Moss. T. Peck was the first cyclist to ride from Land’s End to John o’ Groat’s, 8371 miles, under three days. Many extraordinary rides were accomplished by C. Moss, amongst them being the winning outright of the Bath Road 100 miles Cup, for fastest time three consecutive years, on the third occasion his record being well under 5 hours. This frame was designed to suit inclined engines from 2 h.p. to a 4 h.p. Sets of Motor Bicycle Fittings were also supplied for vertical engines up to 3 1⁄2 h.p. or inclined engines up to 23⁄4 h.p. Before passing the year 1905, it is necessary to mention that the B.S.A. Company in that year commenced the manufacture of their famous Air Rifle, which has since achieved such immense popularity, many even being imported into the U.S.A. – the stronghold of rifle manufacture-despite a 35% ad val. duty. Another phenomenally successful rifle introduced a little later was the B.S.A. Martini Target Rifle. The following year witnessed an important development in the history of the B.S.A. Company, an amalgamation with the Eadie Manufacturing Company, of Redditch, being then completed, which enabled the Birmingham Small Arms Company Limited to greatly increase its capacity for the production of Cycle Components and Cycle Specialities. Chief among these came the Eadie Coaster Hub, Eadie Two-Speed Coaster Hub, Eadie Two¬Speed Hub, and the Hyde Free Wheel, These fitments, together with the B.S.A. Three-speed Hub, B.S.A. Chains, and B.S.A. Free Wheels, gave the Company by far the largest range of coasters, variable gears, free wheels, etc., possessed by any firm or company. B.S.A. Bicycles in the B.S.A. Factories. In announcing the new policy at the Annual Meeting the Chairman stated ” that the Company had decided to widen the policy in regard to the manufacture of complete bicycles. Hitherto only cycle agents were supplied with complete machines bearing an agent’s transfer. In view of the somewhat altered conditions of the trade, it was considered advisable to manufacture a complete B.S.A. Bicycle, under the most rigid inspection, with the world-famed B.S.A. Fittings. There would be one grade of machine-the highest possible quality only. The machine so offered to the public would be listed at a higher price than that at which bicycles built with B.S.A. Fittings had been sold by local agents and makers. The management believed that this would not only create a greater demand for B.S.A. productions, but that it would have a steadying effect on the cycle trade generally. Such a policy must tend to place the B.S.A. Fittings on a higher plane, and to a great extent prevent bicycles built with B.S.A. Fittings being sold at ridiculously low prices, showing little or no margin of profit to the retailer.” Although the new policy was severely criticised, events have proved that it not only helped the trade generally, but was much appreciated by the public. The complete B.S.A. 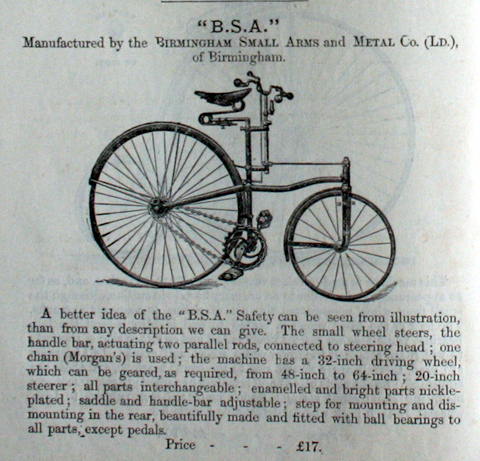 Bicycle produced at The B.S.A. Company’s works bears a special transfer (as illustrated above). The King was enthusiastically welcomed by the work-people at various points during his progress through the factory. Before he departed His Majesty signed the Visitors’ Book, and expressed his satisfaction at all he had seen. His Majesty left by the main gates of the factory, and slowly drove through the cheering crowd of employees. Reproduction of the King’s Signature as it appears in the B.S.A. Visitors’ Book. Amongst other distinguished visitors who have inspected the B.S.A. Works from time to time are Sir Stanley B. Von Donop, K.C.B., who was then Master of Ordnance ; His Highness the Crown Prince of Uganda; Representatives of Dominion Parliaments attending the Imperial Conference ; Members of the Serbian. Mission, etc. Fittingly enough this history, which commenced with the Crimean War, brings us to the days of the Great War, when once again the national demand is “Munitions and still more munitions,” but in far greater quantities than ever conceived possible in 1855. Only with the passing of time will it be possible to obtain a full perspective of all the events now taking place. Suffice it to say that with the declaration of war, in August 1914, the B.S.A. Factories entered on a period of tremendous activity. Day and night, week-days and Sundays, without cessation, munitions were produced in quantities which even surprised the management. Being immediately forthcoming, the value of this aid can scarcely be overestimated ; for it materially assisted our army to “keep up its wicket” in the early days of the War against an enemy of unprecedented strength and organization. Perhaps the most notable of B.S.A. Products for military purposes is the Lewis Automatic Machine Gun. Fortunately the B.S.A. Company previous to the War had made arrangements for manufacturing this weapon, and it was soon possible to supply large numbers for use on aeroplanes, and for other sections of our army. The efficiency and deadliness of the Lewis gun have achieved world-wide fame; its wonderful qualities are enthusiastically recognised throughout the British and Allied Armies. Simultaneously with this enormous acceleration of B.S.A. production, the Company, realising that the struggle would be a long and difficult one, with far-seeing prudence prepared their plans accordingly, and it was not long before a series of huge buildings, erected by the most modern methods, were being added, on a scale never previously equalled in the Company’s history. These additions amounted to about two miles of shops sixty feet wide, and equipped with the finest and newest machinery. During the war the employees in the B.S.A. Factories achieved what was undoubtedly a record in workers’ war investments. Up to the first few days of 1918 no less a sum than £250,000 had been subscribed to the various War Loans. The visit of the Tank Bank to Birmingham was the occasion for a great demonstration, and B.S.A. workpeople, during its one-week stay, gave a remarkable lead to patriotic investors by purchasing 140,000 War Savings Certificates at a total cost of over £ 100,000. Classes are also held in the B.S.A. Works during factory hours, for the purpose of training the boys’ mental faculties, and assisting them to attain a higher proficiency in the particular vocation each one intends to follow. Commencing with instruction in general subjects, for the younger boys, the course is carefully graduated as they progress, until the tuition becomes of a more highly technical character. Apropos of the subject of training the younger generation, it may be mentioned that for many years the “O” Company of the 6th Royal Warwickshire Territorial Regiment was recruited from B.S.A. employees ; this company achieved a number of records for rifle shooting. Upon the outbreak of war it proceeded on Active Service, and honourably acquitted itself throughout the campaign. Shortly after the departure of the B.S.A. Territorials for the Front a cadet corps was formed amongst the B.S.A. boy employees, and soon attained considerable strength and a high standard of smartness. Every effort is thus being made to educate the boys in healthful habits, and to assist them in becoming useful citizens.